Rising high, high above her, the jungle feel of the trees in the gardens at the Ann Norton Sculpture Gardens truly feel like you've stepped into a lost world, despite being only moments from Downtown West Palm Beach, the restaurants, shops, bars, and clubs of Clematis Street, and the luxurious, posh island of Palm Beach. A January wedding celebration for clients from frigid Boston can feel like appearing in a magical world of warmth and green, so far from winter weddings of New England that you can almost forget your numb toes and relax into the warm splendor of the local scene, towering palm trees and all. Choosing to back up from the subject and include a wider view of the gardens gives a sense of place to this portrait, making Alex seem very small and exposed, which highlights the feminine, delicate aspects of her personality. 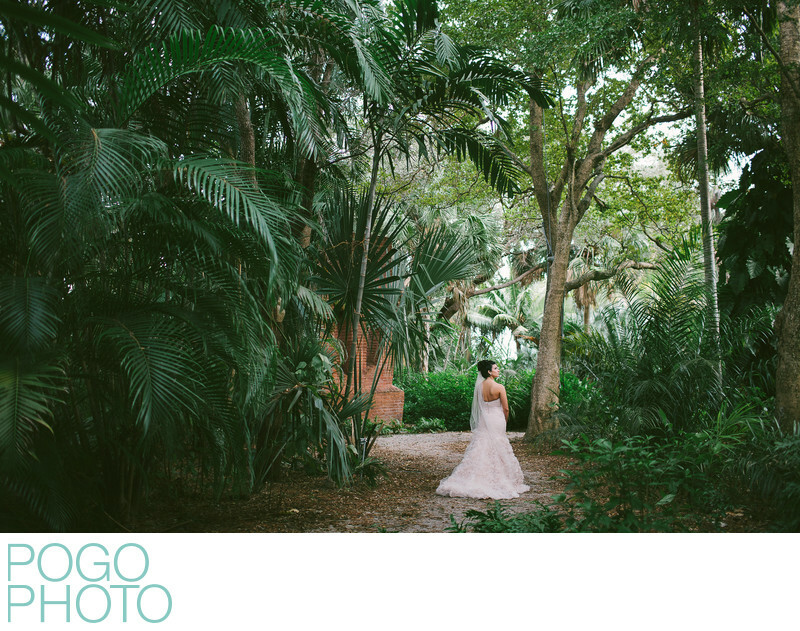 This bride's cascading silk blush gown coordinates perfectly with the lush jungle greenery, offsetting the aging brick of the sculptures beautifully. We love photographing events at ANSG because of the truly unique feel to the gardens, studded with magnificent, towering sculptures and dozens of varieties of soaring palm trees. Though it’s close to the downtown area one would never know it; once you’re within the embrace of this garden there’s no way to see even the nearby condos that overlook this venue. Anyone looking for an old Floridian feel for their wedding should investigate Ann Norton. It’s a stunning alternative to the typical golf club venue, and gives a rustic, vintage charm without any decorating necessary. 1/320; f/2.0; ISO 500; 35.0 mm.